Face and Neck Multi-Action Serum-30 mL. Night Cream Multi action -50 mL. Neutrogena Rapid Wrinkle Repair Eye Cream With Retinol 0 .5 Fl. Oz. No7 Restore and Renew is super nice and not as expensive as some of the department store brand names. 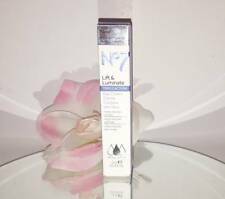 I use have been using other products for the past 15 years that are much more expensive, but read about No7, have seen it on television and it had great reviews. I want to cut my expences, but still get great skin care and so far I like this a lot. I have sensitive skin and I have not had a single problem with this product. I have only been using it for a week or so. I am not going to get a facelift out of a tube and jar, but soft, smoother, firmer and a more even skin tone would be nice. Plenty of time (3 months minimum) consistency and clean skin before application are key to seeing improvement. I am happy with it. This product makes my skin feel so good!!!! I have been using it for a very short time, yet am seeing a nice change in my skin tone, especially the neck area!!!. Awesome roduct at a great price. Nice system to hydrate skin. I usually use Olay products and thought I would try something new after a long stretch. Feeling the change in the weather was hoping this would work well and it has. This past week I feel that my skin balances well as I have an oily t zone & dry elsewhere. What a great price for this 3-piece beauty buy. The serum alone costs over $33.00 on other sites and this set contains full sizes of the serum, day and a night cream for just over $50.00. Delivery was also speedy. No. 7 never disappoints! The products are amazing and make my skin feel so soft. I am anxious to see how it affects my aging skin after using the products over time.